MANILA – An editor-publisher of a community paper in Nueva Ecija some 170 kilometers north of Manila was gunned down in an ambush last Sunday, but police are mystified about the motive for the killing. Senior Superintendent Ricardo Marquez, Nueva Ecija police provincial director, identified the victim as Edilberto Cruz, publisher-editor of Salida, a community paper based in the province of Nueva Ecija. Cruz was riding on board his motorcycle on his way home when he was ambushed by unidentified gunmen. The victim died while undergoing surgery at the MV Gallego Cabanatuan City Hospital. Three days after the killing of Cruz, police investigators could not categorically why Cruz was murdered, considering that his newspaper reports development stories. The Philippines has been in the limelight because of the spate of media killings, including the massacre of 57 people, including 32 Filipino journalists in Maguindanao, southern Philippines on Nov. 23, 2009. A number suspects headed by the powerful Ampatuan family in the province of Maguindanao have been charged in court in connection with the mass killings. 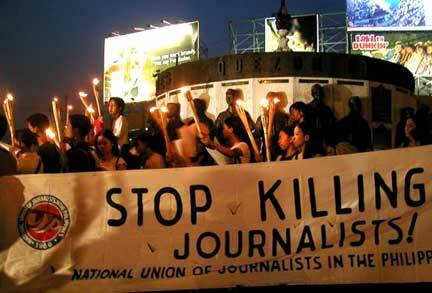 Some 141 Filipino journalists had been killed since 1986.